The fatal golf cart crash that occurred in December, 2016, in Pasco County, highlighted the serious, growing problem of golf cart accidents in Florida. In this particular case, a Jeep Cherokee and a golf cart were traveling in the same direction on a dark, unmarked road. The Jeep hit the rear of the golf cart, the vehicle turned over, and the four passengers were ejected. Each year thousands of people are injured nationwide in golf cart accidents. Even those who do not drive their vehicles on dark, unmarked roads can be seriously injured in crashes when jolted or thrown out of their vehicles. The best strategy for avoiding injuries due to these types of accidents is to follow commonsense safety guidelines. Under Florida law, golf carts are not supposed to be operated on public roads unless they are clearly designated for golf cart use. Golf carts can cross a county road that intersects a road approved for them, but again, the road should have signs that indicate golf carts are allowed. Defying the law and driving on other roads is dangerous for you, your passengers, and people in other vehicles, since golf carts cannot go more than 20 mph and can obstruct other traffic. Florida law also states that golf carts can only be driven during daylight hours unless the local government permits night driving. If golf carts are permitted at night, then they must have headlights, taillights, brake lights, turn signals, and a windshield. In addition, according to Florida law, children under the age of 14 are not be allowed to operate golf carts. Following commonsense rules of safe driving is important for avoiding golf cart accidents, especially in The Villages, where so many people use carts to get around. First, do not drive when intoxicated or under the influence of a drug that affects your sense perception and ability to concentrate and react quickly. Second, avoid other distractions, such as texting, talking on the phone, reading, or doing something else with your hands, when driving. Operating the golf cart as it was meant to be operated can also go a long way toward ensuring your safety. This means not loading it with more people than there are seats, driving from the driver’s side, not allowing anyone to stand in the vehicle, and making sure that everyone keeps their arms, legs and feet inside the cart at all times. Safe driving also includes taking precautions when turning and backing up. When driving a golf cart, you should always use hand signals to indicate you are turning, check blind spots before making your turn, and turn and look behind you before backing up. Making left hand turns can be tricky if you’re in a golf cart lane, since you need to merge with the thru traffic and make your turn from that lane. Remember to always, always yield to other traffic. Knowing how to brake and turn safely can help you avoid rollovers and passenger ejections. Typically, golf carts have brakes only on the rear wheels, so hard braking can result in skidding and instability. This is especially dangerous when going down hills, where you might think the brakes are not functioning. Pressing them down harder could lock your wheels and lead to losing control of the vehicle. You can also lose control of your vehicle if you turn at high speeds. Golf carts are not meant for speed, and turns, especially if they are sharp turns, can destabilize the vehicle, causing it to roll over. Roll overs are serious in any vehicle, but even more so in golf carts, since passengers have little to prevent them from being thrown from the cart. Golf cart safety also depends on having a vehicle that functions the way it is supposed to. As with any vehicle, proper maintenance is important in helping you avoid serious accidents. 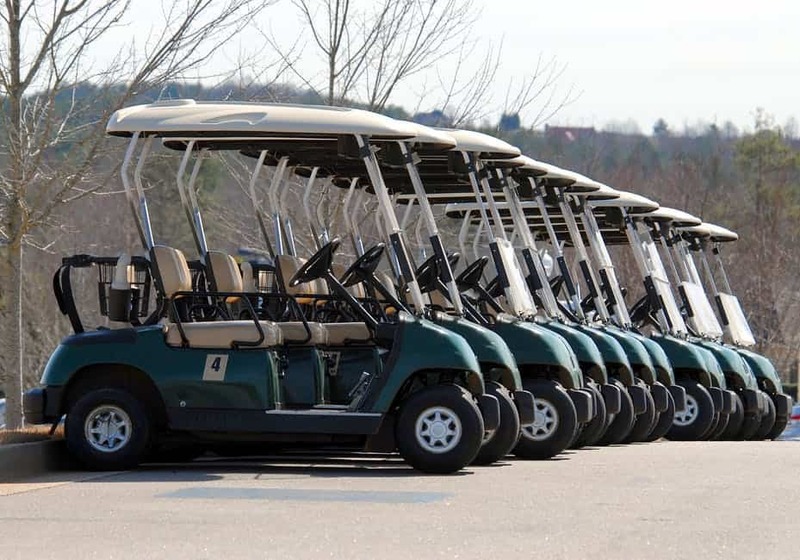 Florida law requires golf carts to have efficient brakes, safe tires, reliable steering, a rear view mirror, and reflective warning devices on the front, rear and sides. Checking the tires for adequate inflation, fixing brakes and steering mechanisms that are not functioning properly, and making sure all lights operate are necessary for your safety. Many golf carts do not have seatbelts, and they are not required by law. However, they do make riding in your vehicle much safer. Safety experts suggest you have them added to your golf cart and use them anytime you’re using the vehicle. An accident can still occur, but the chances of you or your passengers getting seriously injured is greatly reduced. Even after taking all necessary safety precautions, golf cart accidents do occur. If you or someone in your family has been injured in a golf cart accident in The Villages, you need an experienced personal injury attorney to fight for your rights and ensure you get the financial compensation you deserve. For expert legal representation, call the Glover Law Firm at 352-205-4495 or contact us online.